After emigrating to the United States in 1923 where he studied art, Bolotowsky became associated with “The Ten”, a group of modernist activists intent on rebelling against the status quo represented by academic art. 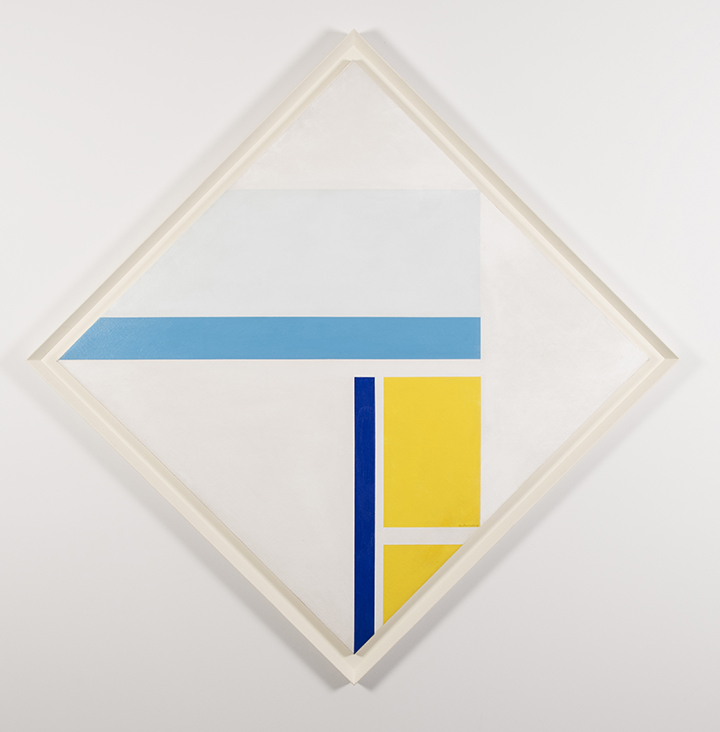 Bolotowsky was influenced by Piet Mondrian and worked under the strictures of the De Stijl movement, which advocated an ideal order in art, manifest in straightforward geometry and the use of primary colors. From 1946 to 1948, Bolotowsky taught at Black Mountain College, NC, which was then under the leadership of the geometric abstract painter Josef Albers. Kenneth Noland (also featured in the exhibition) was one of Bolotowsky’s students. Bolotowsky, a vocal advocate of abstraction and a frequent exhibitor in New York and elsewhere, believed that geometric abstract compositions gained their visual power, not through adhering to fixed objective formulas, but rather through intuition. This is clear in his untitled composition, on display, which is systematic and ordered, but not formulaic in approach: variations in color and form show his sense of instinct in balancing disruption with structure.